Visitors to Somerset House in London have been experiencing the air pollution of different global cities, inside a series of domes created by artist Michael Pinsky. 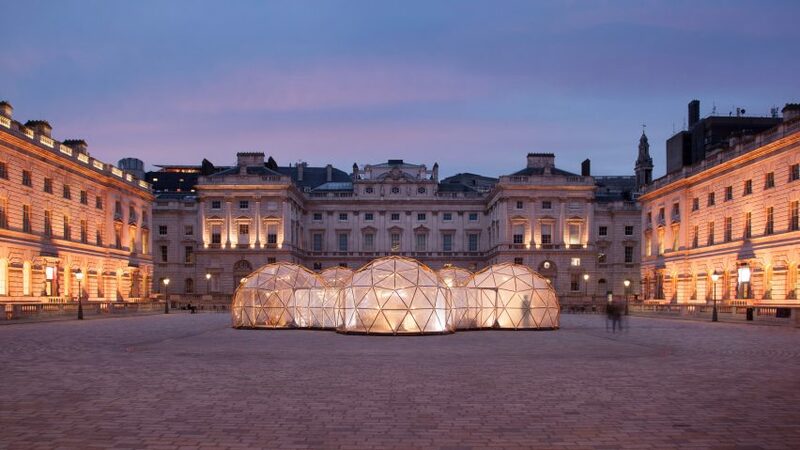 The installation, created for Earth Day, is made up of five interconnected geodesic domes that form a ring in the courtyard of Somerset House. Each of the domes contains an atmosphere that simulates the levels of pollution found in a different city. Visitors enter a dome that contains the very pure air experienced in Tautra, the peninsular on the coast of Norway where the project originated. From this dome they can circulate through the installation to experience what the air is like in London, Beijing, São Paulo and New Dehli. With levels of air pollution rising in many of the world's major cities, numerous designers are looking to address the issue. An exhibition at Milan design week showcased concepts to reduce air pollution by designers including Kengo Kuma, while last year Daan Roosegaarde envisioned a bicycle that would clean polluted air. Pinsky created the installation in London to highlight the levels of air pollution people living in a city experience daily – something he describes as entirely avoidable. "Pollution affects my family and I every day in London. And unlike many cities in the world, London's pollution is entirely avoidable," Pinsky told Dezeen. "Simple policy changes prioritising the pedestrian and the cyclist would make an enormous difference." "Many parents still drive their children to school, polluting our streets at exactly the time that children are out on the streets. Children have not yet learnt to breath through their noses so much of the pollution reaches their lungs unfiltered," he said. The atmospheres created in the climatically controlled domes, which are safe to experience, were created with technical expertise from the Norwegian Institute of Air Research. They each approximate the specific environments of the cities, which were chosen because they suffer from very different types of pollution. Pinsky designed the installation to change people's perceptions of consumerism and climate change. "I want people to engage with the issue of pollution viscerally, to challenge the notion that we alway need to travel in our private bubble whilst consuming cheap goods from the east," he said. The structures were made by a London-based design startup called Build with Hubs, which has developed a kit of parts that can be combined with local materials to create geodesic domes. For this project the joining elements were brought from Norway, where the installation was previously built with locally recovered Norwegian Spruce used to create the spans. "I do think that we all have a responsibility to consider the impact our profession has on others, whether it be locally in London, or globally," continued Pinsky. "I was particularly interested in working with BuildwithHubs, as it is more ecological to transport only the complex bits of a structure and then source the simple parts locally." The installation opened at Somerset House on 22 April 2018, Earth Day, and finished today. The domes will now be placed in storage, with plans being formed to take the exhibition around the world. Somerset House also installed an environmentally themed installation for last year's Earth Day – John Gerrard created a simulated flag of black smoke as a symbol of climate change. Photography is by Michael Pinsky unless stated.